The democracy-inspired, youth-led (at least initially) anti-government uprising in Egypt at the start of this year was hailed in the West as a model revolution. The people had made their will known, and a repressive dictatorship had been toppled with surprisingly minimal bloodshed. But it wasn't long before problems started to arise. Decidedly anti-democracy Islamist groups almost immediately hijacked the movement, and the ruling military council that had originally won the praise of revolutionaries began to demonstrate worrying behavior. Having found themselves pushed to the sidelines by these dominant forces, average Egyptians have now returned to the streets to effect yet another regime change. "The people want to topple the regime," young Egyptians chanted in Cairo's Tahrir Square on Saturday during a day of intense clashes with security forces that left two people dead and hundreds more wounded. The violence quickly spread to Alexandria and Suez, and was still going strong on Sunday morning. The new uprising is happening just days before Egypt is scheduled to hold its first presumably democratic election since the fall of former dictator Hosni Mubarak. Staggered voting is set to begin on November 28, but many of the political parties set to contest the vote are already crying foul. At the center of the tension is an effort by the ruling military council to impose rules for a new constitution that would leave the army independent of civilian control. In essence, no matter who is elected to government, the military would still reign supreme in Egypt. While average Egyptians are rightly protesting the military council's moves, their efforts are unfortunately expected to aid the increasingly influential Muslim Brotherhood. With elections so soon after the toppling of the Mubarak regime, there has been no time for any other major political party to emerge and become known. The Muslim Brotherhood, on the other hand, has been around for over a century, and has been a major player not only in Egypt, but throughout the Middle East. 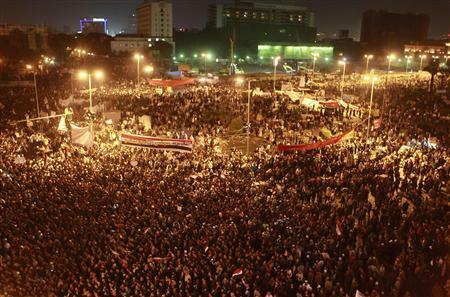 It's message of conservative, corruption-free politics is appealing to many Egyptians tired of crony authoritarianism. But many experts warns that just as average Iranians were duped by Ayatollah Khomeini following the fall of the shah, so too will Egyptians eventually find themselves living under a tyrannical theocracy if they elect the Brotherhood. The community that will suffer first and most severely under such a scenario is Egypt's 10 million Coptic Christians. Already the Copts are experiencing a huge escalation in local persecution since the fall of Mubarak and the rise of the Muslim Brotherhood and other Islamist movements. Last week 10 Christians were wounded after coming under attack by Muslims during a march in a Cairo neighborhood. The march was to mark the end of 40 days of mourning after 27 Christians were killed in sectarian clashes with Muslims in September.